I am having so much fun with my new Black Lab Puppies Mono Print fabrics available from my Shop at Spoonflower.com. Above is a toddler's fleece hoodie. The pattern, Yia-Yia's Snuggle Hoodie, is from the book, Little One Yard Wonders. It was really easy to sew up! It's perfect for the cool Fall days which will be here soon! I also made a little "Hugging Pillow" to give the the older sister of the baby boy who is getting my Busy Beach Town Quilt. It my Black Labs printed on Minky on one side and cotton fabric from the "Uppercase" line from Windham fabrics on the back. Spoonflower.com wisely requires makers to order test prints of new designs. (I've caught some errors in the printed fabric that I never saw on my computer screen). The most economical way to get a test sample is to order an 8 inch square swatch, seen on the far left below. It's a fun challenge to find ways to use the swatches. This little 8 inch square pillow is a great size for a 2 year old to hug and carry around! Our church organist and his wife, a soloist in the choir, are also expecting a baby. The church ladies had a baby shower for them last weekend. I made a little taggie, a mini security blanket, for them. It is 10 inches square, with Minky on the front and 100% organic cotton sateen on the back. Both are fabrics are available from my Spoonflower shop. (I sewed around the edges of the ribbon tags. I worry about little fingers getting trapped in open loops and having circulation cut off). And finally, I've added another Black Lab puppy to the fabric collection. This puppy is a bit older than the paired puppies and so a big larger. She is wearing a bandana with the cherries print on the right with the darker blue background. 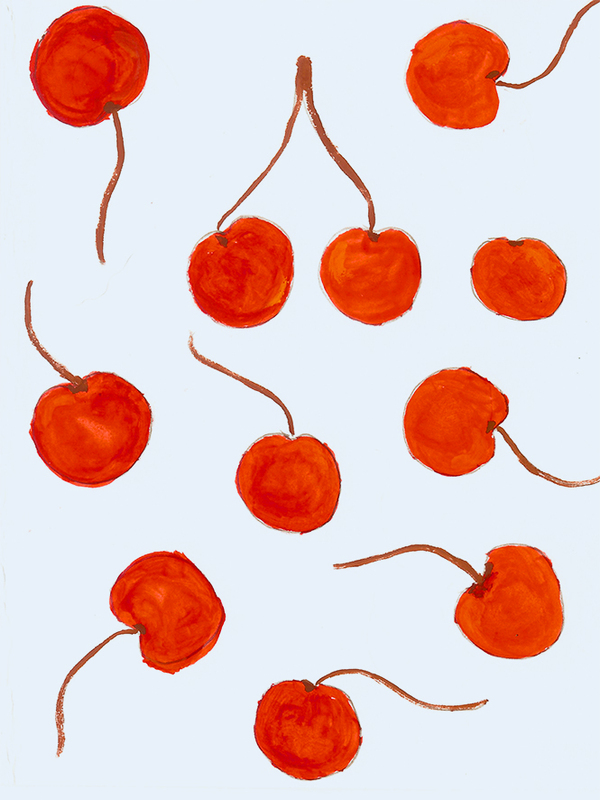 This pattern is "Farmers_Market_Cherries", also available in my shop at Spoonflower.com.